Passos, A. S., Dias, F. F., Barros, S. R. S., Santos, P. R. A., Souza, C. R. G. & Vargas, R. Sea level rise and its likely impacts: a case study in the coast of Mangaratiba-RJ. Pan-American Journal of Aquatic Sciences, 13(4): 260-272. Download PDF file (3,867 Kb). Vargas-Ceballos, M. A., Vega-Villasante, F., García-Guerrero, M. U., Chong-Carrillo, O., Badillo-Zapata, D., López-Uriarte, E. & Wehrtmann, I. S. Salinity effect on embryonic development and survival of the first zoeal stage of Macrobrachium tenellum (Smith, 1871) (Crustacea, Palaemonidae). Pan-American Journal of Aquatic Sciences, 13(4): 273-281. Download PDF file (932 Kb). Ceni, G. & Barreto, A. P. Reproductive aspects of Schizolecis guntheri (Loricariidae: Hypoptopomatinae), in an Atlantic Forest stream, Southern Brazil. Pan-American Journal of Aquatic Sciences, 13(4): 282-288. Download PDF file (1,736 Kb). Donnangelo, A., Franco, D., Simonetti, B. L., Silva, V. E. C. & Aschenbrenner, A. Record of whale shark (Rhincodon typus) sighting in the Arvoredo Biological Marine Reserve vicinity, Santa Catarina State, Brazil. 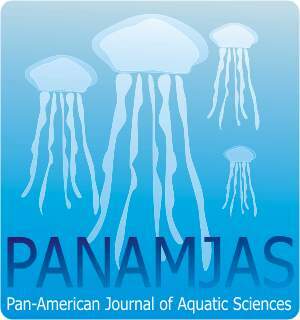 Pan-American Journal of Aquatic Sciences, 13(4): 289-291. Download PDF file (355 Kb). Schejter, L, Acuña, F. H., Garese, A., Cordeiro, R. T. S. & Pérez, C. D. Sea Pens (Cnidaria: Pennatulacea) from Argentine waters: new distributional records and first report of associated anemones. Pan-American Journal of Aquatic Sciences, 13(4): 292-301. Download PDF file (2,593 Kb). Craveiro, N., Alves-Júnior, F. A. & Rosa, J. S. Fo. New records of the deep-sea fireworm Chloeia kudenovi Barroso & Paiva, 2011 (Polychaeta: Amphinomidae) from Southwestern Atlantic. Pan-American Journal of Aquatic Sciences, 13(4): 302-305. Download PDF file (1,000 Kb). Paschoal, L. R. P., Lacerda, L. E. M. & Miyahira, I. C. Taking a ride! Phoretic association of the freshwater limpet Gundlachia radiata (Planorbidae: Ancylinae) and the apple snail Pomacea lineata (Caenogastropoda: Ampullariidae), with the description of a new record of this ancylinid in SE Brazilz. Pan-American Journal of Aquatic Sciences, 13(4): 306-310. Download PDF file (743 Kb). Salavarría, E., Macaya, E., Gil-Kodaka, P., Paul, S. & Troccoli, L. Haplotype diversity of Macrocystis pyrifera (Phaeophyceae: Laminariales) in the central and southern coast of Peru. Pan-American Journal of Aquatic Sciences, 13(4): 311-319. Download PDF file (846 Kb).